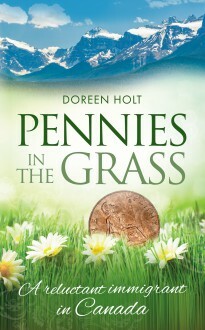 Pennies in the Grass – the title refers to those occasional, unexpected joys which sometimes come along to make a hard life seem worthwhile – is the story of a Liverpudlian woman who reluctantly followed her husband to Vancouver, Canada, in the 1960s in pursuit of a better life. The book deals with the author’s experiences as a child in England growing up in the Great Depression of the 1930s and World War II, the many challenges to her health after she sailed to Canada, the sadness, stresses and terrible struggles of a homesick immigrant and her eventual achievement of peace, stability and even romance. Anyone interested in the social history of Great Britain in the mid twentieth century and the difficulties and hardships of immigrants will find much that is familiar, inspiring and valuable in this book.